Happy 4th wedding anniversary to you and hubby, Roma. Enjoy the day and years to come too. 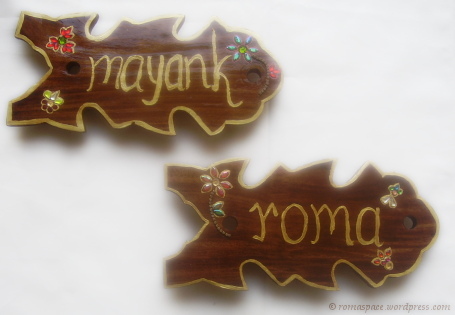 happy anniversary Roma and Mayank….that’s a lovely gift….wishing you many more wonderful years together…. Those nameplates are so sweet. Thanks for your wishes, Dear All. Dinner by candles and flowers made it very memorable! Belated anniversary wishes. Wishing you many more years of surprise dinner. Rather belated but wishing you both a very Happy Anniversary, Roma. I think that’s a wonderful gift. I hope you enjoy the butterscotch blondies and thanks for letting me discover your blog. 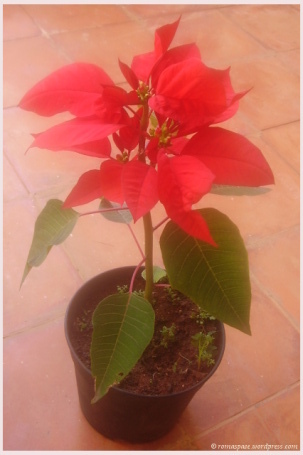 Awww that is so sweet loved the name plates and the poinsettia, belated anniversary wishes Roma, wish you many more happy ones! Belated anniversary wishes dear Roma. The name plates you have made are awesome. Amazing handwork.